Maybe you want to hover the toolbar on the left side, or you want to align the "..." more button differently. 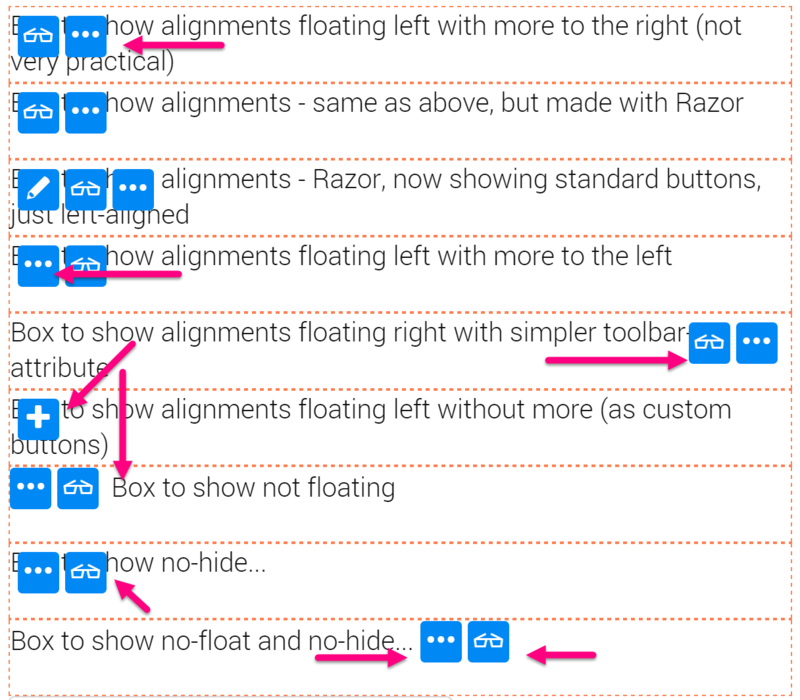 Maybe you need Left-To-Right-support, or you just want to add custom CSS classes. show behavior, because by default (if inside an area with the class sc-element) it will always require a hover. But if you create an admin-dashboard or something, you may want to always show it. placement of the "..." (more) button - because when left-aligning a menu or when not-floating it, the position to the right is kind of annoying. custom CSS classes for whatever reason / decoration you want to apply. This will be applied to the <ul> tag which contains the buttons. This should help you create exactly the UI experience you want to provide. For anyhing more, you should try the tutorial App or read the 2sxc wiki, specifically the edit-overview.